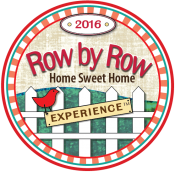 Row By Row Experience > 2016 Row by Row Kit "Slow Road to Home Sweet Home"
2016 Row by Row Kit "Slow Road to Home Sweet Home"
2016 Row by Row PATTERN Unfinished dimensions: 9.5" x 36.5" Alternate size included in pattern for wall hanging or table topper, finished size: 12" x 42"
This pattern specially created for the 2016 Row by Row Home Sweet Home Experience. These adorable snails were designed by owner Dawn Farrier. Many of her childhood memories include hours of playing with these cute creatures including snail races with her mom. 2016 Row by Row Kit -- Unfinished dimensions: 9.5" x 36.5" Alternate size included in pattern for wall hanging or table topper, finished size: 12" x 42"
Kit includes all fabric, embellishments and floss. Backing fabric not included.